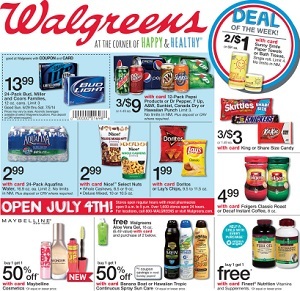 This week Walgreens weekly ad circulars, store flyer, deals and specials. Save with the Walgreens store circular featuring the best discounts and promotions on consumer goods and services. Check for great savings on: Sunny Smile Paper Towels or Bath Tissue; Nice! Deluxe Mixed Nuts; Aquafina Water; Folgers Classic Roast or Decaf Instant Coffee; King or Share Size Candy; Doritos or Lay’s Chips; Maybelline Cosmetics; Planters Peanuts; Orville Redenbacher’s Popcorn Pop Up Bowl; Maxwell House Wake Up Roast Coffee; Nice! Peanut Butter, Grape Jelly or Strawberry Preserves; Chicken of the Sea Chunk White Tuna; Breyers Ice Cream; Haagen-Dazs Bars; Betty Crocker Cake, Cookies or Brownies Mix; French’s Yellow Mustard; Sweet Baby Ray’s Barbecue Sauce; Oscar Mayer Wieners; Barilla Pasta; Prego Pasta Sauce; Sparkle Paper Towels; Good & Delish Dried Fruit; Laundry Detergent; Palmolive Dish Liquid; Colgate Toothpaste; Secret, Old Spice or Gillette Antiperspirant/Deodorant or Body Spray; Revlon Colorsilk Hair Color; Coppertone or Bain de Soleil Sun Care; Neutrogena Skin, Shave or Bath Care; L’Oréal Skin Care; CoverGirl Cosmetics or Olay Fresh Effects Skin Care; Revlon Cosmetics and Beauty Tools; Nice! Dishwashing Liquid; Energizer AA or AAA Max Batteries; and much more. Walgreens stores activate their latest weekly ad every Sunday. Walgreens has 8,678 stores in all 50 states, the District of Columbia, Puerto Rico, the U.S. Virgin Islands and Guam. It was founded in Chicago, Illinois, in 1901 and the headquarters are in the Chicago suburb of Deerfield, Illinois. The company provides access to consumer goods and services, plus pharmacy, photo studio, health and wellness services.